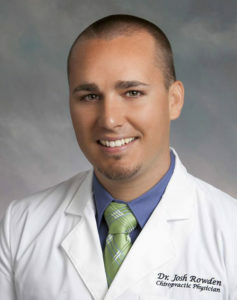 Dr. Josh Rowden, D.C. is a Rogers, AR native. Born and raised in Arkansas, Dr. Rowden wanted to join a profession that would allow him to “give back” to the community that raised him. Dr. Rowden received his Doctorate of Chiropractic from Parker College of Chiropractic in Dallas, TX. He holds a Bachelors of Science in Health and Wellness, as well. Upon graduating from Chiropractic College, he returned to his home town, and founded NWA Health Solutions, P.A. Dr. Rowden is dedicated, passionate, and determined to help patients who suffer from chronic conditions and are left with no answers and no help. Dr. Rowden married into a large chiropractic family, encouraging him to be the best doctor he could be. His wife, Dr. Sarah Morter Rowden, is also a chiropractor. Dr. Rowden’s mentor, his wife’s grandfather, Dr. M.T. Morter, Jr. was the developer and founder of B.E.S.T. (BioEnergetic Synchronization Technique). B.E.S.T. is practiced by thousands of health care professionals around the world. Dr. Rowden is honored to have known and worked so closely with Dr. Morter over the years. Dr. Rowden’s father-in-law, as well as many other in-laws (including aunt, uncles, cousins, and siblings) are also in the chiropractic profession. Dr. Rowden focuses on working with many conditions, including: Chronic Fatigue, Thyroid Disorders, Chronic Neurological and Metabolic Disorders, such as Migraines, Vertigo/Dizziness, as well as, Knee Pain, Neck Pain, and Back Pain. Dr. Rowden attends many seminars annually to continue his studies in relevant fields. He considers himself a life-long student of health. Dr. Rowden enjoys attending each seminar and improving upon his knowledge base. He wants to guarantee each patient that he is providing the most up to date care available.